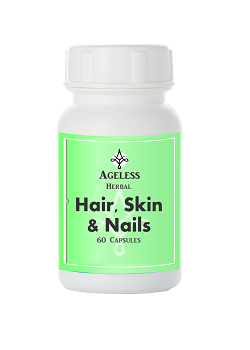 Hair Skin Nail Capsules is simply the very best supplement to take for your hair, skin and nails. Apart from being a great multivitamin supplement, it also contains Aloe vera and grape seed extract to help improve the condition of your skin hair and nails by boosting your total nutritional status. Nutrition impacts on your appearance, since diet affects your skin, nails and hair, as well as your energy levels. Naturopathic philosophy maintains that your skin reflects the condition of your liver – too many toxins lead to a dull, spotty sallow skin, as well as low energy levels. The Hair, Skin and Nail formula was specially created to assist with the nutritional needs of your hair, skin and nails, and this must be one of the reasons why it is a top selling supplement. If you are looking at increasing the quality of your hair, skin and nails, and an excellent multivitamin supplement, get this supplement today. Our Hair, Skin and Nail formula has combined the ingredients underneath, in specially formulated quantities, to bring you the best supplement to fulfill the nutritional needs of your skin, hair, nail – and overall nutritional supplementation. Vitamins: The fat-soluble vitamins and beta-carotene as well as the water-soluble vitamins have important roles in the synthesis of new tissue and maintenance and repair of damaged cells. Kelp: Kelp is a valuable source of iodine and other trace minerals. Gelatin: This is a protein source for building tissue. Trace elements and minerals: Minerals are often deficient in the diet especially if refined foods are eaten and are necessary for cell growth and building healthy tissues including nails hair and skin and repairing damage. Your hair skin as well as nails are very sensitive to deficiencies in the diet and the vitamins and minerals provide a basis for improving your nutritional status to get and keep these tissues strong and resistant to infection and environmental factors. Various antioxidant compounds have also been included in this formulation to aid detoxification and so promote healthy glowing skin. These antioxidants vitamin A bioflavonoids rutin beta-carotene and selenium are essential in repair of damage caused by pollutants in the environment smoking and poor dietary habits. These ingredients vitamin A bioflavonoids rutin beta-carotene and selenium all have great properties to promote general well-being as well. Betaine helps in the breakdown of fats by the liver in other words betaine is a lipotropic substance. It is also a component of lipoproteins and plays a role in the structural integrity of cell membranes. Inositol and choline are vitamin like substances and are components of cell membranes and are also lipotropic (that is they aid the removal of fat from the liver). Methionine and cysteine are sulfur containing amino acids and contribute to the structure of proteins. Cysteine also plays a role in energy metabolism and in the liver is used to form the amino acid glutathione which helps detoxify potentially harmful substances. Methionine is a sulfur-containing amino acid. It cannot be synthesized by the human body and must be obtained from the diet. It plays an important role as a precursor for the synthesis of other sulfur containing amino acids (cysteine and taurine). Methionine donates sulfur and other compounds required for the synthesis of many other substances such as choline, creatine, adrenaline and carnitine which are all important for the efficient production of energy in the body. This herb is particularly beneficial to the skin. It has been used in Europe for many years as an effective remedy for skin ailments and people can attest to its cell regenerative properties. Grape seed extract has powerful antioxidant properties with specific anti-ageing benefits for the skin, which result in improved elasticity. Grape Seed Extract has been combined with the other ingredients in our Hair Skin and Nail Formula to bring you the best multivitamin product which will specifically also help in these three areas. Take two capsules daily preferably right after a meal. A whopping 29 nutritional compounds are blended together to specifically improve the health of your looks. Promote a clear healthy glowing and younger-looking skin. Helps your body create strong healthy and robust nails and improving the rate of growth. Looks after the health of your hair to promote shiny healthy hair and improved hair growth.